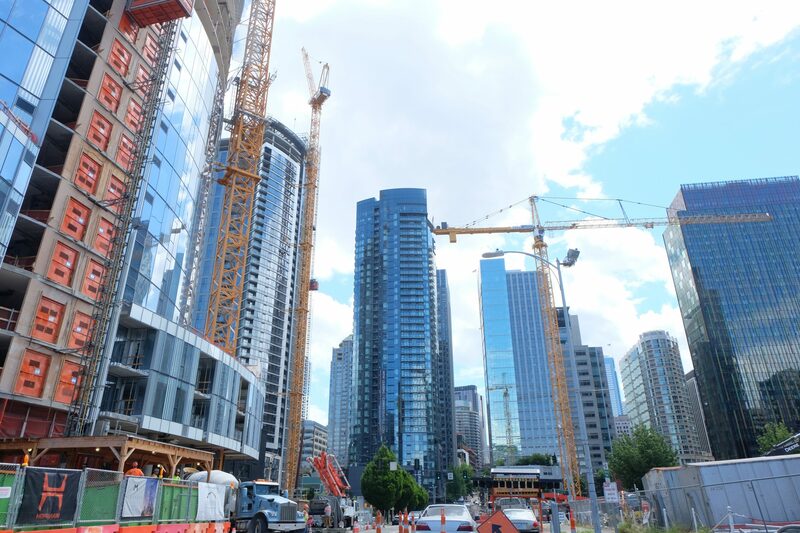 SEATTLE – The Downtown Seattle Association’s 2017 Mid-Year Development Guide indicates a record $5 billion in current construction activity downtown. Residential builders are racing to meet demand with more than 30,000 units under construction or in development. Hotels continue to invest in new rooms, and as more employers locate downtown, commercial contractors are poised to deliver millions of square feet of new office space. A mix of public and private investment is fueling this transformative growth in downtown Seattle. The Pike Place MarketFront expansion, Hing Hay Park improvements and other public space enhancements are providing more community assets for people who live, work or visit downtown. Industry leaders like Amazon, Apple, Facebook, F5 and Google are expanding their downtown footprints, bringing additional workers and residents to downtown, and spurring additional economic growth in downtown neighborhoods. There is currently $5 billion in construction activity, a 40 percent increase over last year and more than triple its lowest point in 2011. Residential projects continue to dominate, representing two-thirds of all projects under construction downtown. Most of this continues to be focused on apartment development. The pace of office construction has nearly tripled over the past decade, which will deliver over the next three years as much square footage as was delivered in the previous nine. Hotel development is setting records, including what will be the largest hotel in the region – a new 1,264-room Hyatt Regency in the growing Denny Regrade area. That project will be completed in 2018. For a link to the Development Guide and other downtown construction information, please visit our development homepage. DSA publishes two development guides each year to quantify the total amount of residential and commercial development activity taking place within downtown Seattle. An annual update summarizing all development activity for the previous calendar year is published in February. The Downtown Seattle Association was established in 1958. The DSA is a member-based non-profit organization focused on creating a healthy, vibrant downtown. By advocating on behalf of business, non-profit, arts and residential interests throughout downtown Seattle, the DSA ensures that downtown Seattle is a world-class place to live, work, shop and play.